From the little knowledge that I have scoured over the internet, I am satisfied that Shivaism was a great religion (and it still is)…I mean, there are just too many monuments that takes you back to its roots. The Great Living Chola Temples are one of the many Shiva temples that dot the Indian landscape. The Great Living Chola temples were built by the kings from the Chola Empire. The Empire reigned over South India and some of the neighboring Islands. The temples are a classic representation of the Dravidian Temple architectural genius. Of Cholas, it is said that they were the second great historic dynasty of the Tamil Nadu from Tamil Country. It is from this country that the ancient Dravidian culture rose to influence the whole of East Asia. To kick off the great Dravidian culture, the true founder of the Chola Empire, King Raja Raja (985 to 1014) built the Temple of Tanjore from 1003 to 1010. His empire would later spread to Ceylon, Maldives and Laccadive archipelagos. As if to demonstrate its royal heritage, the temple had permanent staff including hundreds of priests, 400 sacred dancers and 57 musicians. The Chola Empire was rich and the wealth was utilized to maintain and improve buildings until the 17th century. The temple lent money to traders, sometimes with interest rates going as high as 30%. This is how it maintained its relevance for so long. The Brihadisvara Temple at Gangaikondacholisvaram - built by Rajendra I, was completed in 1035. Its 53-meters sanctum tower has recessed corners and a graceful upward curving movement, contrasting with the straight and severe tower at Thanjavur. The Airavatesvara Temple at Darasuram - built by Rajaraja II, at Darasuram features a 24-meter tower and a stone image of Shiva. The three temples are exceptional reflection of the achievements of the Chola architecture especially in bronze casting, sculpture carving and painting. 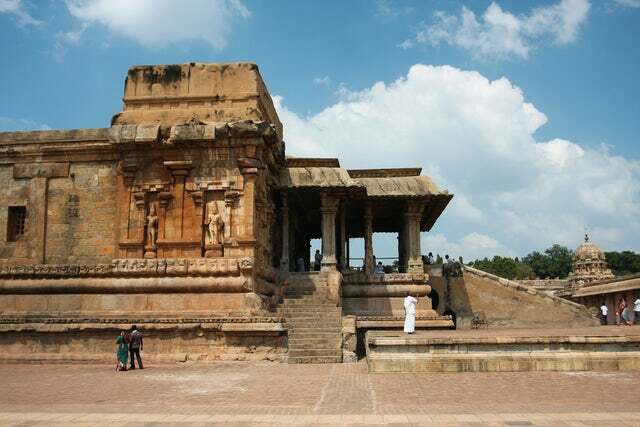 My two cents worth of advice is to make haste and visit these great Chola Temples – the ancient cathedrals of Europe certainly have got some serious competition from these temples.